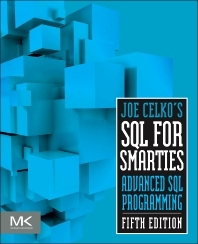 SQL for Smarties was hailed as the first book devoted explicitly to the advanced techniques needed to transform an experienced SQL programmer into an expert. Now, 20 years later and in its fifth edition, this classic reference still reigns supreme as the only book written by a SQL master that teaches programmers and practitioners to become SQL masters themselves! These are not just tips and techniques; also offered are the best solutions to old and new challenges. Joe Celko conveys the way you need to think in order to get the most out of SQL programming efforts for both correctness and performance. New to the fifth edition, Joe features new examples to reflect the ANSI/ISO Standards so anyone can use it. He also updates data element names to meet new ISO-11179 rules with the same experience-based teaching style that made the previous editions the classics they are today. You will learn new ways to write common queries, such as finding coverings, partitions, runs in data, auctions and inventory, relational divisions and so forth. SQL for Smarties explains some of the principles of SQL programming as well as the code. A new chapter discusses design flaws in DDL, such as attribute splitting, non-normal forum redundancies and tibbling. There is a look at the traditional acid versus base transaction models, now popular in NoSQL products. You’ll learn about computed columns and the DEFERRABLE options in constraints. An overview of the bi-temporal model is new to this edition and there is a longer discussion about descriptive statistic aggregate functions. The book finishes with an overview of SQL/PSM that is applicable to proprietary 4GL vendor extensions.